One of the things I do frequently that really makes me want to kick myself in the teeth is the way I respond to the question, “How are you?” Most of the time, when someone asks you this question, you know they’re just being polite or trying to make conversation, so sometimes it feels really awkward to respond with a genuine answer like, “Oh I’m good, but I’ve had an awful week.” Respond like that and people think you’re complaining. Respond with something like, “Oh everything is great and I’m doing awesome!” and people think you’re bragging or not staying humble. So what happens when you feel like you’re navigating through a fire swamp when answering this question? A lot of us (unfortunately, myself included), default to this answer: “Oh I’m good, but you know, busy.” And here’s where the rabbit hole begins. Why does this seem to be the most socially acceptable answer to such a generic and loaded question? 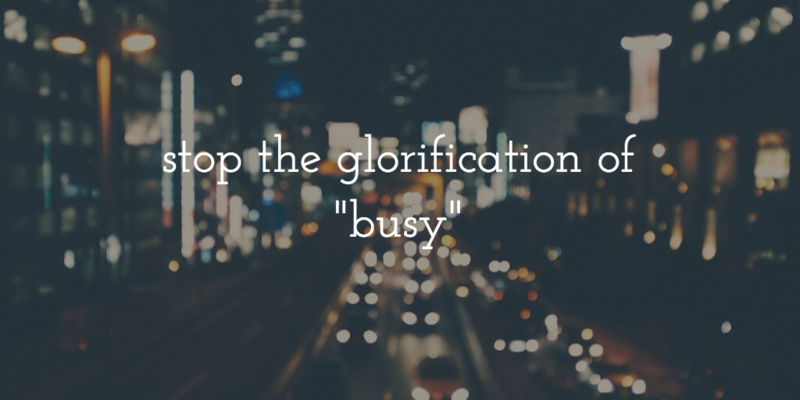 I think, as Americans, we value work and productivity so much that ‘busy’ becomes synonymous with ‘good’. It’s like answering with a complaint that’s not really a complaint and a boast that’s not really a boast all in one. People usually tell us this is a good problem to have or some other generic answer and we default to talking about work or whatever’s making us “busy”. So before I go any further, I have to tell you that this post is mostly inspired by an article I read called The ‘Busy’ Trap, and a little inspired by Being Busy isn’t Important. I may summarize some points for the first article while I add my own insights, but I highly recommend you go read it. [pause] Back now? Okay. Before you respond with “busy” as part of your answer, let’s take a moment to assess that response. Are you really, truly busy? Are you working two jobs, then coming home to learn something new to better yourself and get a higher paying job? Are you working full-time, then taking care of kids without a break for the other 8 hours in your day? There are a lot of people that are actually busy. Are you one of them? If you are, kudos to you. You’re not off the hook yet. I want to challenge you to “un-busy” yourself – don’t roll your eyes at me just yet. For the rest of you, if you’re not actually busy, why do you feel the need to tell people you are? Let’s examine that and provide a better response. 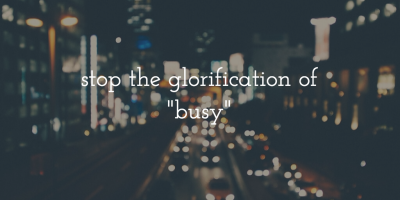 Why is Busy a Good Thing? It seems like an acceptable and safe thing to say without sounding like a weirdo. We want people to appreciate that we work hard or have been successful in something (which is decidedly not the same as busy). We feel like we have a lot on our plate and misery loves company, right? We certainly don’t want others to think we’re idle. The horror! Okay, so are you actually busy? Probably not. If you’re just looking for a response that doesn’t seem awkward or like it’s inviting some weird questions, try saying something like, “I’m good. I’m happy I ran into you,” or, “I’m well, thanks. I’m learning to (insert something here).” I’d rather talk about what I’m learning anyway. If you want recognition for your successes, ask yourself where this recognition should come from? God love my mother, she is clueless about sports. While I appreciated her support and enthusiasm growing up, telling her I was an All-League selection for a sport didn’t really make a difference to me as she didn’t understand what in the world I was saying. She would just be excited that I was happy and that was that. However, I was a lot more satisfied with congratulations from my dad or my brother, who actually understood the time and effort I put into gaining that honor. So how is “busy” relevant? Do you want to discuss work, your successes, or your “busy” with everyone, thinking that their recognition will make you happy? If they don’t understand the achievement, you probably won’t be satisfied with it anyway. If you want them to know something that you think they’d like to know and would understand / appreciate, then say it. “I’m good, very excited that I was awarded X thing,” won’t seem boastful to your friends, who will actually care about what you’re saying. They’re your friends so that you can share these things with one another, right? So what if you just acknowledge that you don’t want people to think you’re idle? I get this sometimes because I work at home now, and some people talk out both sides of their mouth when they find this out. They’ll wish you well and express jealousy while at the same time think you’re spoiled and don’t work as hard as they do (nevermind the work put into getting to this point, but that’s another discussion). Again, why do you care? And why should I be defined by the work I do or how much of it I do? I’d rather be defined by my interests, hobbies, and the actions I take. So I’d rather just tell people about what I’m learning or reading rather than give the cop-out, “I’m busy.” If you really don’t want to have a conversation with someone, then just say, “I’m well, thanks!” and leave it at that. The awkward feeling will subside. So the deeper thing that also interests me here is the idea that we need to be busy in order to have respect or feel good about ourselves, or that we think busy is the best ‘state’ to be in. Instead of taking this idea for granted, how about we ask, “Why?” Many people like to talk about how busy they are, then would later say something about how they wish they had time to do X, Y, or Z. Well, you could if you would shift away some of that “busy” you got goin’ on. Here’s the first thing about being busy: most of us are actually procrastinating and disguising it as busy-ness. We read news, check out emails or Facebook, and do all sorts of small time-sucking activities. I’d rather be efficient. Most of the time, I can get the same amount of work done in five hours that people do in eight (or more). So why keep working? I’d rather enjoy the time freed up by true productivity. Focus on efficiency instead of merely busy-ness. While the fisherman isn’t necessarily “busy”, it’s a reminder to assess what you actually want. Do you want to be busy? (Why in the hell would you want that?) Or do you want to get your work done and enjoy your time? Do you actually want to build a business? Or do you want freedom? What can you trade for what you want? Busy-ness isn’t bad if that’s what you want, but being busy for the sake of feeling like you have meaning or actually achieve something isn’t admirable. Don’t try to emulate something by emulating the symptoms; success may make you busy, but that doesn’t mean that being busy generates success. And again, is it success you actually want? Tough questions. So my goal, which I invite you to consider and possibly share, is to first stop telling people I’m busy, then to actually stop being busy. I want to stop telling people I’m busy (even if I am) because I’d like to stop perpetuating the idea that being busy is something to be idolized. I don’t actually want to be busy, and I don’t want to be told it’s admirable. I want people to get excited with me over new things to learn or do, and I’d rather talk about those things. I also want to become actively un-busy. For me, this comes back to my overall goal of living intentionally. Do I want to read more, spend more time with friends, go outside more? Yes. Okay, so make it happen. But I have all of these other obligations to do? Fine, get rid of them. It’s a choice. It may certainly be a difficult choice, but it’s a choice all the same. Put the effort into getting a different job, live within your means (or below them even! ), or actively start saying “no” to more people who ask for your time. But understand it’s a choice to be busy, and it’s a choice to get un-busy. I don’t want to be idle and will still work, but I don’t want to live my job. At this point, most people say, “But blah blurb blah!” (usually something along the lines of needing money for this or that). I get it. No really, I do. I had loans and such, too. I put a lot of effort into living frugally to pay them all off so I didn’t need as much money. I know getting un-busy may take some more busy in the short run – believe me, I’ve done it and I know it was hard. But know that if you say you need to keep working to have this career or make this much money, you’re choosing that over having mai-tais with me on the deck. And that’s okay, but I don’t want to be busy. Instead, I want to be better than busy. I want to do exactly what it is that I want to do, and will unashamedly work for that and self-imposed idleness rather than for the sake of being busy. Update: I just read this article from Tyler Wardis that relates to the same article and covers the same ideas, but far more eloquently than I did if you’re interested.